NTPC Limited is the largest power utility in the country with an installed capacity of 43.143 MW and an additional 23,839 MW capacity under construction. To realize the vision of becoming a world class power major, NTPC plants to become a 1,28,000 MW company by the year 2032. The company has been conferred with coveted Maharatna status by govt. of India for its outstanding achievements over the years. 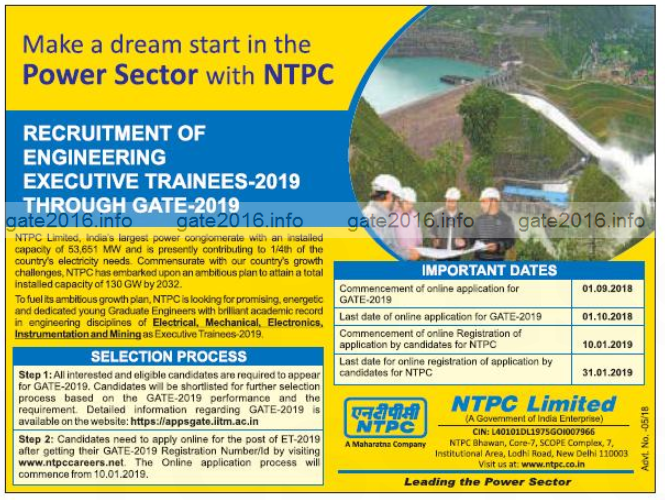 (2) Second fill NTPC online application with GATE-2019 registration number. OBC (Non Creamy Layer) / SC/ST / PWD candidates : No Fee. (2) The final selection will be done after Group Discussion (GD) and Personal Interviews (PI). Hi, I m BCA passout holding with 65% mark. Can you have any job for me????? Admin,please tell me which are the PSU’S can manufacturing engineers apply? Please check table 1 and table 2. I visited the given website. But that given only the choice of GATE papers for PSU’s.It didn’t tell which Bachelor degree must be studied for eligibility? That list is designed as per GATE papers list. There are only 23 papers in GATE papers list. So a candidate need to choose any one subject for gate exam out of those 23 papers. If you have done engineering in a subject which is not the part of that papers list than you have to choose a subject which is close to any of these 23 subject papers. Eligible criteria is always based on your whole engineering performance not just a year’s performance. Even it is final or first. how many seats will be there for CS stream…any guess?? there was a lot of inforamation to know. Bit I was searching for the GATE syllabus please give me link of this information. Thanks for the post. You shared a valuable information. I t is like my dream job. Thanks for the information. I am studying BE Manufacturing engg.Can I apply in Mechanical category. Candidates holding BE degree in Manufacturing engineering are not eligible for Mechanical Discipline in NTPC.